Update: Adopted! Sugar has found her forever home!! 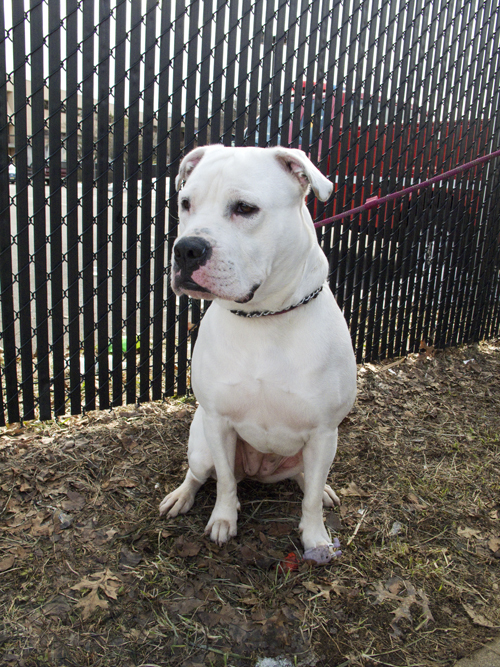 Sugar is a two year old white American Bulldog. She is as sweet as her name! Sugar's people turned her over to the shelter because their two other small dogs pestered her incessantly. She is housebroken, crate-trained, spayed, micro-chipped and up to date on her shots. She is a perfect lady on the leash and soaks up affection like a sponge. Our volunteers adore her! Sugar would love to be an only dog in house where she could get all of the attention she so richly deserves. If you are interested in Sugar, please contact us or call the Edison Animal Shelter at 732-248-7278. You may also stop by 125 Municipal Blvd. Edison, NJ to visit her, she is in Cage #5.